Welcome to our Heirloom Garden! Our Heirloom Pepper and Tomato Plants come in a Rainbow of Colours, Shapes and Sizes. Enjoy our Heirlooms with a story. Our Hortiultural tips help make your garden a success. Heirlooms are plants whose seeds have been handed down through families and friends for many generations.We not only give you fine Heirloom Plants and Vegetable Seeds to grow in your garden, but their historical background and nutritional benefits. 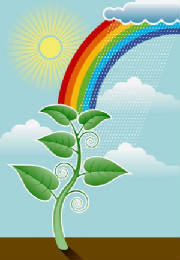 Nature's Rainbow specializes in Heirloom Vegetable Seeds and Heirloom Tomato Plants. The vegetable seeds we offer you are all from organically grown heirloom plants that have been carefully selected for their natural diversity along with their varied form, colour, and great taste and nutrition. Many heirloom vegetable plants are also ornamental enough to be added to flower gardens. Check out some of the attractive varieties that we have available. Many of the heirloom vegetables seeds, such as cucumbers, pole beans and peas, indeterminate tomatoes, and melons, lend themselves very well to vertical gardening in small spaces using trellises, fencing and poles. Even apartment dwellers with a sunny balcony can treat themselves to heirloom peppers, beans,heirloom tomatoes, radish, eggplant, swiss chard, summer squash and leaf lettuce, all of which can be container grown. If you are interested in preserving Nature's best, and appreciate vegetables with flavour, texture, and aroma, we welcome you now to discover many fascinating heirloom vegetables seeds that you can grow in your garden this year. Enjoy the unique varieties of heirloom bean seeds, heirloom beet seeds, heirloom carrot seeds, heirloom corn and cucumber seeds , heirloom lettuce and kale seeds, and heirloom squash seeds. We have many varieties of heirloom melon seeds that grow well in cooler climates.